Jagruti Group Bhavnagar is organizing "JivanSathi Pasandagi Melo" on 22nd May 2018 at Bhavnagar. Any person belonging to Koli cast can be apply and register them self for this. Kindly contact Mr. Anilbhai Dabhi for more information. Jagruti Group Bhavnagar is organizing "JivanSathi Pasandagi Melo" on 22nd May 2018 at Bhavnagar. Any person belonging to Koli cast can be apply and register them self for this. Kindly contact Mr. Anilbhai Dabhi for more information. 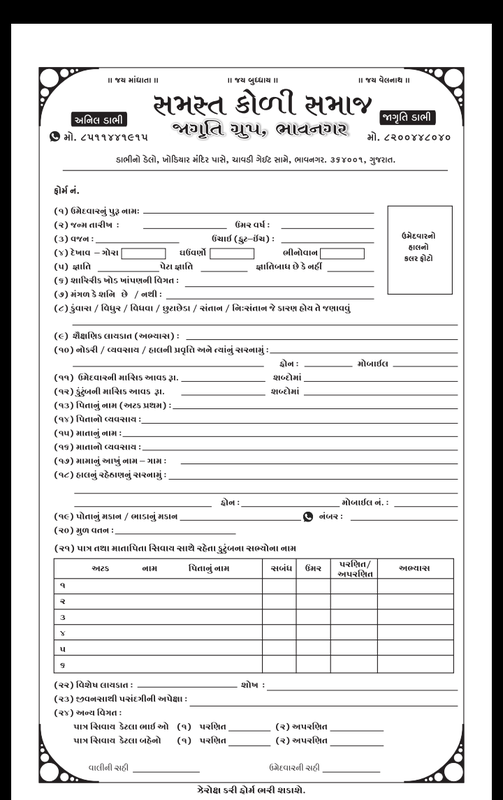 Interested candidate have to fill following form and submit ti to mention address with necessary fees. candidate must have to follow following rulles.